If you’re staying in New York City for a while and can’t stand being all cramped up with millions of people everywhere, let it be known that New York State is beautiful, and not all full of pollution. There are plenty of places to catch a breath of fresh air that are a short car ride away. If you get a New York State Empire Passport and have the sticker on your car, the fees are waived. Note: If you are heading up from the city through I-87, MAKE SURE THERE IS NOT A YANKEE GAME at that moment, as you’ll be sure to hit bumper-to-bumper time. Also avoid rush hour commuter times during weekdays. The Rockefellers have donated a huge preserve to New York state in Westchester County. It is very manicured and not very hard to hike, so it’s a nice place if you like fancy things and don’t mind running into a few snobby horse riders. Rockwood is one section of the Rockefeller estates (where it is free to park) that is on the Hudson River, and it has some beautiful trees planted there and enchanting hiking trails. There are great views of the River, the palisades rock formations over in Rockland County, and the Tappen Zee Bridge. One good spot in the greater Rockefeller Preserve is Swan Lake, which has a short hike around a lake, or you can venture off into some of the manicured farmlands and look at the cows. It costs $7 to park by Swan Lake. It takes about 50 minutes to drive up here from NYC. Dogs are allowed on leash. 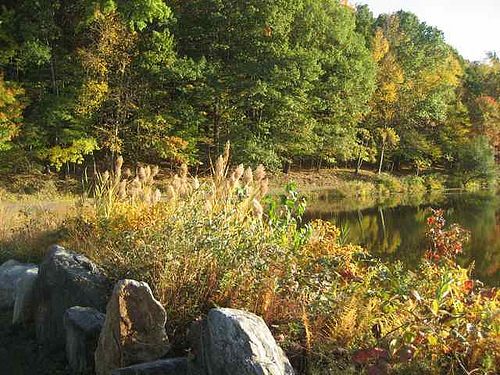 This is a small nature preserve located in Westchester County. It is hidden away in the woods by some quaint houses and windy roads, so make sure to print out directions. It has a few trails along a nice little lake, that has a short wooded bridge where you can observe the turtles and fish in the shallow water. It gets crowded in the summer with day camps, but not so much in the winter. It takes about 50 minutes to drive up from NYC, depending on traffic. It’s free to park. Dogs are allowed on leash. 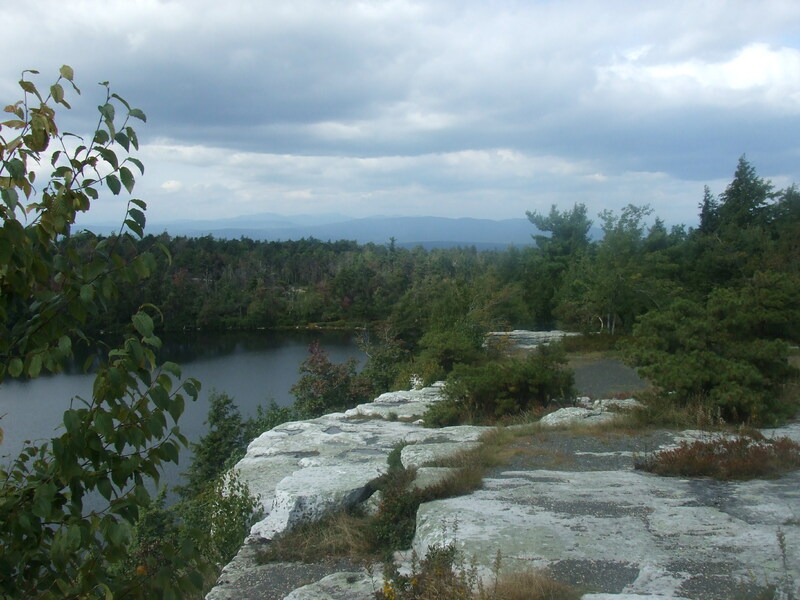 This is a huge park located on the Shawangunk Ridge, which is outside of New Paltz, New York, a cute little college town. The drive up there itself is quite nice, especially in the fall foliage. The park has a small lake with a 2 mile trail around it near the entrance, with some beautiful rock formations that line it. If you go further into the park, you can do some amazing hikes that can be up to 9 or 10 miles, if you and your dog are ambitious. There are crazy views of the surrounding areas from way high up, waterfalls and all sorts of geological formations. The hiking itself isn’t too rugged, as it’s all on a carriage path. Dogs are allowed on leash, and should be in good health for this place. It is located in Kerhonkson and Ulster Counties, about an hour and a half away from NYC. It’s $7 to park. 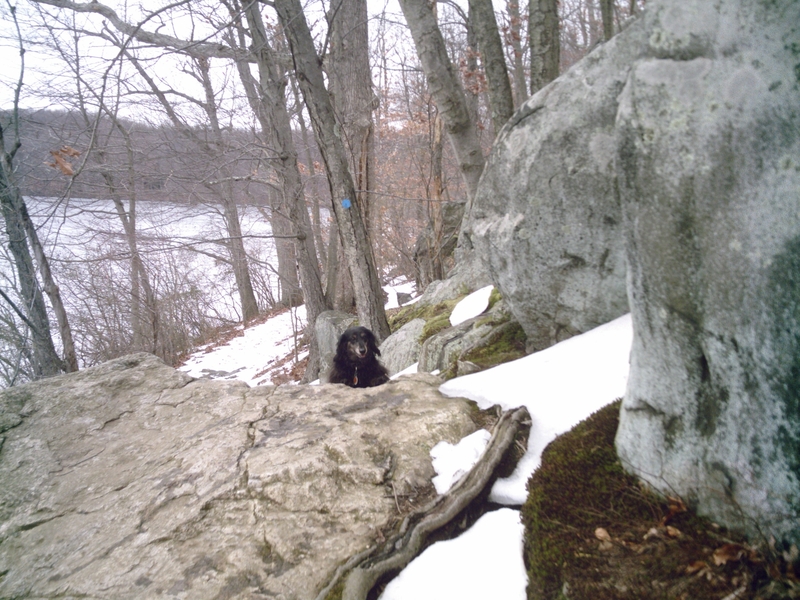 Bear Mountain is a wonderful place that is great for people of all ages, and for dogs. A lot of people come up from New York City in the summer on the weekends, so it can get a little crowded. 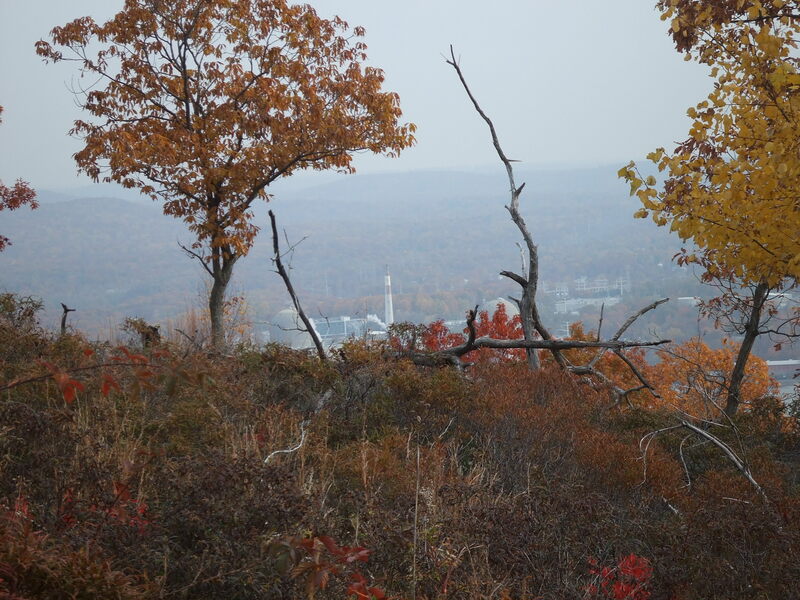 There are fields and tons of hiking trails, and you can see the NYC skyline from many of the peaks on a clear day. There is also ice skating in the winter. Some other trails have nice views of Indian Point, the nuclear power plant! Harriman has 7 beautiful lakes and lots of hiking that isn’t too crowded, as most of the people go for the water. This park is in Rockland and Orange Counties, and it is about 1-1.5 hours away from NYC, depending on what route you take. Dogs must be muzzled and on leash. Definitely get a trail map if you are doing an all-day hiking trip. Parking is $7. This is a 14,000 acre park in Putnam and Dutchess Counties. There are hiking trails and amazing lakes. Have a hiking trail map handy, as it’s easy to get lost here. It doesn’t get very crowded, and some people come up here from New York City to escape the hustle and bustle. In the summer, people like to go to fish, swim and boat, but people often cross-country ski in the winter. Make sure your car is in good shape because some of the roads are not finished, especially if you want to go to any of the far-in locations. The nearest nice town is Cold Spring, which is full of antique shops and located on the Hudson River. It is about 1.5-2 hours up from New York City, but the drive is awesome on the Taconic State Parkway. Dogs are allowed on leash, and can go on campsites. King of sad that dogs are required to be on a leash and Harriman State Park requires a muzzle. I wonder if someone can confirm that muzzle business? How do you muzzle a Pug? Is it really required for all breeds? A bit ridiculous, I should think. I have hiked Harriman 30+ times and brought both my dogs and have never once muzzled them. We see countless dog owners and dogs when we hike there and NONE of the dogs are muzzled. Either that information is incorrect, or the law has changed, or they just don’t enforce it. Hi! I just wanted to post that on April 16 th 2013 my brother went hiking with our two dogs and one of them ran away. We have been looking for him ever since with no luck. We are all devastated and are hoping he’s out there. If anyone will be hiking up there please keep an eye out for a medium build pitbull looking gray black and white brindle dog. His name is Achilles and he’s very friendly but if he’s scared he could get defensive. Thank you to anyone who reads this and will keep our dog in mind if they are hiking. We lost him around the town of Ramapo but I’m sure by now he could be anywhere. Even if you just spot him please contact bear mountain police. They have the dog on file and at least we will know he is still alive. Thank you so much. So they are not strick on the muzzle rule, but must be a leash 6 feet or less and as far as the lost dog, have you contact Hi Tor Animal Shelter and Ramapo Police? They pull tons of dogs from that way and your dog may be there!